24kt Gold Mosaic Glass Smooth 10mm (3/8 Inch) is real gold leaf fused into the face of the glass and sold in units of 10 tiles. These are superior to the “gold” tiles sold by competitors for two reasons: First these are real 24 kt gold instead of the brass alloys the competitors sell as real gold (seriously). Second, the gold is fused into the surface of tile so that it is inside the glass instead of just being on the back side of a piece of glass. 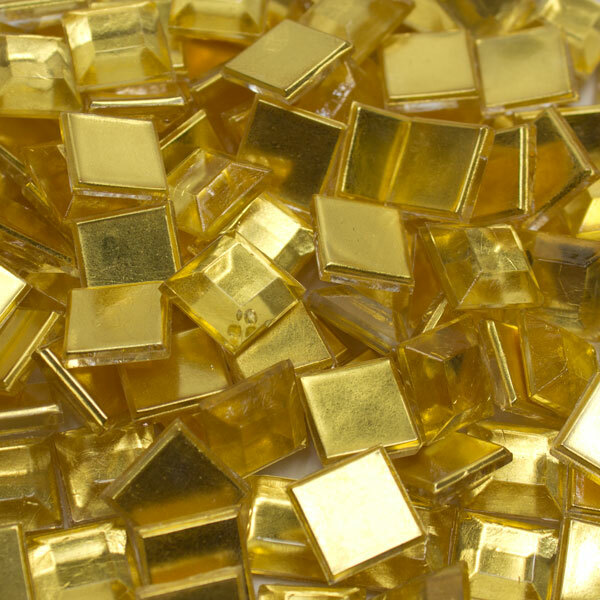 We also sell the competitor’s product correctly labeled as Imitation Gold Mosaic. If you are reproducing a mosaic icon or a piece of traditional religious art, using real gold instead of brass mirror tile is an easy way to make your work look more authentic. To cover 1 square foot with a standard grout gap, 796 tiles are needed. Most mosaic mounting paper is 1.15 square feet and requires 841 tiles (29 tiles x 29 tiles). Use our tile estimator to calculate how much you need for your project. Add about 5% extra to account for cutting scrap. These can be mixed and used with most brands of 3/8 inch mosaic tile because their thickness is 1/8 inch nominal (4mm), which is a common industry standard.